Detecting and fixing equipment problems can lead to significant savings in energy and operational costs as well as improvements in occupant comfort. Pre-programmed FDD algorithms are a standard feature of the WebCTRL® building automation system and will alert building staff of potential equipment issues, help them identify the cause, and provide a visual display of preventive solutions. FDD can help reduce energy consumption, capital costs, and equipment wear and tear. The built-in FDD capabilities of the WebCTRL system allow building operators to identify and respond to issues when they matter most - before they happen. By providing them with analytic tools that uncover potential problems with their HVAC equipment, they can take corrective action before system performance is compromised. FDD alarms are automatically generated in the WebCTRL® system to warn operators of problems which may be causing equipment to run inefficiently, wasting energy and/or degrading occupant comfort. 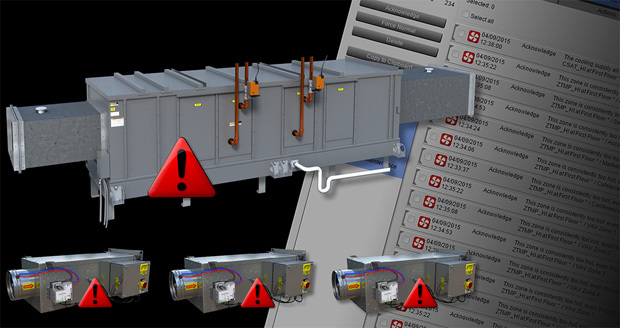 Fault Detection and Diagnostics (FDD) uses the power of robust algorithms, hard data and strong reporting of the Automated Logic WebCTRL system. FDD can measure, anticipate, provide insight, and automatically respond to system conditions that are not necessarily critical, but may be trending that way – all with the goal of improved operational performance.